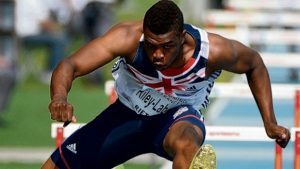 THERE were a number of impressive performances by Thurrock athletes at the British Championships in Birmingham at the weekend. Khai Riley-Laborde grabbed a bronze medal in the 110 metre hurdles final. The Enfield AC athlete ran in a time of 13.96. He was only beaten by top athletes, Andrew Pozzi and David King. Hayley MacLean produced a seasons best to come fourth in the 400 metre hurdles in a time of 57.71. Hayley competes for Chelmsford AC. The race was won by Meghan Beesley in a time of 55.73.